The Institute for Supply Management (ISM) reported that manufacturing activity continued to expand solidly in March, even as it pulled back from the best reading since May 2004 in February. The ISM Manufacturing Purchasing Managers’ Index declined to 59.3 in March, but the data continue to indicate strength in the sector overall. Indeed, the indices for new orders and production have exceeded 60—a threshold suggesting robust expansions for both measures—since at least June 2017. Exports and employment growth also remain quite healthy despite some deceleration in the March figures. Exports, for instance, had expanded at the fastest rate since April 2011 in February, with international sales helping to fuel stronger overall demand. Indeed, U.S.-manufactured goods exports have risen roughly 5 percent in January and February relative to the same two-month period last year. With a brighter economic outlook, hiring has accelerated. Manufacturers added 22,000 workers in March, extending the 32,000 gain in employment in February. It was the sixth consecutive month with robust hiring growth in the sector, averaging 27,167 per month over that time frame. As such, the latest jobs numbers confirm that the labor market has tightened significantly, with manufacturers increasing employment by a rather robust 18,733 per month on average since the end of 2016. That is quite a turnaround from the sluggish job growth in 2016, and it is a sign that firms have continued to accelerate their hiring as the economic outlook has strengthened and demand and production have improved considerably. Along those lines, average weekly earnings for production and nonsupervisory employees in the manufacturing sector edged down to $901.39 in March. However, that translated into a whopping 4.1 percent increase over the past 12 months, up from $865.26 in March 2017, which further illustrates the strength of the labor market right now. Since the end of the Great Recession, manufacturing employment has risen by 1,179,000 workers, with 12.63 million employees in the sector in this report. That is the highest level of manufacturing employment since December 2008. Despite the healthy increase in employment in manufacturing, nonfarm payrolls increased just 103,000 in March, well below the consensus estimate of around 190,000. This represented a notable easing from February’s solid gain of 326,000 workers. Weather might have been a factor in the slower activity in March. Meanwhile, the unemployment rate remained at 4.1 percent for the sixth straight month, continuing to be the lowest level since December 2000. Meanwhile, other measures also reflected solid growth in the manufacturing sector right now. For example, new factory orders rose 1.2 percent in February, bouncing back from a decline of 1.3 percent in January. Much of that swing in activity stemmed from a sizable increase in aircraft orders, which can be highly volatile from month to month. Excluding transportation equipment, new orders for manufactured goods inched up 0.1 percent in February. Overall, new factory orders have trended sharply higher over the past year. Along those lines, sales of manufactured goods have soared 7.1 percent since February 2017, or 6.4 percent excluding transportation equipment sales. Core capital goods—or nondefense capital goods excluding aircraft—have jumped 7.7 percent over the past 12 months. Finally, private manufacturing construction spending rose 1.2 percent in February, rising for the sixth straight month. The value of construction put in place in the sector increased to $66.84 billion in February. Since falling to $60.92 billion in August, private manufacturing construction has started to trend higher, which would be consistent with the recent uptick in economic activity and a stronger overall outlook. With that said, construction in the sector has drifted lower since achieving the all-time high of $82.13 billion in May 2015. Along those lines, manufacturing construction has declined 5.6 percent year-over-year. For now, however, the good news is that the sector appears to have turned a corner, moving in the right direction. This week, there will be new readings on consumer and producer inflation. In the beforementioned ISM survey (and in other recent sentiment releases), prices for raw materials have remained highly elevated, with the ISM’s measure at a level not seen since April 2011. This reflects a rebound in some commodity costs, even as overall pricing pressures continue to be largely under control, at least for now. Other highlights for the week include updates on consumer confidence, job openings and small business optimism. ADP reported that manufacturers added 29,000 workers in March, the fastest monthly growth in employment in the sector since October 2014. This once again illustrates the robustness of the labor market in light of strong increases in manufacturing activity and improvements in the overall outlook. Indeed, manufacturing business leaders have hired at a healthy rate since the end of 2016, averaging nearly 15,700 per month over the past 15 months. In contrast, manufacturing employment was more sluggish in 2016, illustrating the turnaround in the labor market since then. More importantly, continued strength in job growth is expected moving forward. Meanwhile, total nonfarm private employment increased by 241,000 in March, changing little from the 246,000 job gains added in February. It was the fifth consecutive month with job growth of at least 200,000 in the U.S. economy, according to ADP’s estimates. Over the past 15 months, nonfarm payrolls have risen by almost 197,000 workers per month, up from an average of nearly 172,500 per month in 2016. In March, the largest employment growth included professional and business services (up 44,000), trade, transportation and utilities (up 40,000), construction (up 31,000), education and health services (up 28,000), leisure and hospitality (up 26,000), financial activities (up 18,000) and other services (up 17,000). Small and medium-sized businesses (i.e., those with fewer than 500 employees) accounted for 72.2 percent of the net job growth for the month. The Bureau of Labor Statistics reported that manufacturers added 22,000 workers in March, extending the 32,000 gain in employment in February. It was the sixth consecutive month with robust hiring growth in the sector, averaging 27,167 per month over that time frame. As such, the latest jobs numbers confirm that the labor market has tightened significantly, with manufacturers increasing employment by a rather robust 18,733 per month on average since the end of 2016. That is quite a turnaround from the sluggish job growth in 2016, and it is a sign that firms have continued to accelerate their hiring as the economic outlook has strengthened and demand and production have improved considerably. Indeed, manufacturers have told us that challenges in recruiting new workers is their primary business concern right now. Along those lines, average weekly earnings for production and nonsupervisory employees in the manufacturing sector edged down from $901.84 in February to $901.39 in March. However, that translated into a whopping 4.1 percent increase over the past 12 months, up from $865.26 in March 2017, which further illustrates the strength of the labor market right now. Since the end of the Great Recession, manufacturing employment has risen by 1,179,000 workers, with 12.63 million employees in the sector in this report. That is the highest level of manufacturing employment since December 2008. Despite the healthy increase in employment in manufacturing, nonfarm payrolls increased just 103,000 in March, well below the consensus estimate of around 190,000. This represented a notable easing from February’s solid gain of 326,000 workers. Weather might have been a factor in the slower activity in March. Meanwhile, the unemployment rate remained at 4.1 percent for the sixth straight month, continuing to be the lowest level since December 2000. In addition, the so-called “real” unemployment rate, which includes discouraged and other “marginally attached” workers, fell from 8.2 percent to 8.0 percent, the lowest level since November. In March, durable goods manufacturers added another 22,000 workers on net, but employment at nondurable goods firms was flat. The largest increases included fabricated metal products (up 8,800), transportation equipment (up 4,800, with motor vehicles and parts up 3,300), miscellaneous nondurable goods (up 3,500), furniture and related products (up 3,300), computer and electronic products (up 2,800), electrical equipment and appliances (up 2,000) and machinery (up 2,000), among others. In contrast, employment declined in several segments in March, including printing and related support activities (down 2,500), chemicals (down 1,700), primary metals (down 1,100) and paper and paper products (down 1,000). The Census Bureau reported that privatemanufacturing construction spending rose 1.2 percent in February, rising for the sixth straight month. The value of construction put in place in the sector increased from $66.08 billion in January to $66.84 billion in February. Since falling to $60.92 billion in August, private manufacturing construction has started to trend higher, which would be consistent with the recent uptick in economic activity and a stronger overall outlook. With that said, construction in the sector has drifted lower since achieving the all-time high of $82.13 billion in May 2015. Along those lines, manufacturing construction has declined 5.6 percent year-over-year. For now, however, the good news is that the sector appears to have turned a corner, moving in the right direction. Overall, private nonresidential construction spending increased 1.5 percent in February, with year-over-year growth of a very modest 1.1 percent. In the latest figures, the data were mixed but mostly higher. 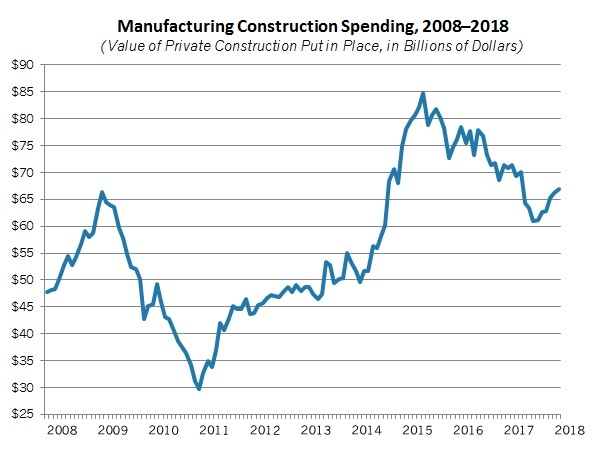 In addition to increased manufacturing construction spending, there were more dollars spent on construction projects in the office (up 6.5 percent), educational (up 5.3 percent), lodging (up 2.7 percent), commercial (up 1.2 percent), power (up 0.9 percent) and amusement and recreation (up 0.4 percent) sectors. At the same time, activity declined in the following segments: communication (down 3.0 percent), religious (down 2.6 percent), health care (down 2.2 percent) and transportation (down 1.3 percent). Meanwhile, private residential construction spending edged up 0.1 percent in February, with 5.5 percent growth over the past 12 months. More importantly, private residential construction spending registered $533.40 billion in February, the best reading since January 2007. In the latest data, single-family and multifamily construction rose 0.9 percent and 1.2 percent in February, respectively, with single-family activity jumping 9.5 percent year-over-year. In addition to those components, public construction spending fell 2.1 percent in February, with a gain of 1.6 percent over the past year. The Census Bureau reported that new factory orders rose 1.2 percent in February, bouncing back from a decline of 1.3 percent in January. Much of that swing in activity stemmed from a sizable increase in aircraft orders, which can be highly volatile from month to month. Indeed, defense and nondefense aircraft and parts orders jumped 34.8 percent and 26.2 percent in February, recovering much of the reduction in January’s data. Excluding transportation equipment, new orders for manufactured goods inched up 0.1 percent in February. Overall, new factory orders have trended sharply higher over the past year. Along those lines, sales of manufactured goods have soared 7.1 percent since February 2017, or 6.4 percent excluding transportation equipment sales. Core capital goods—or nondefense capital goods excluding aircraft—also rose 0.1 percent in February. These can often be seen as a proxy for capital spending in the U.S. economy, and February’s increase followed declines in both December and January. Encouragingly, much like the headline numbers, there has been a healthy gain of 7.7 percent over the past 12 months. Durable goods demand increased 3.0 percent in February, but excluding transportation, new durable goods orders edged up just 0.1 percent. In contrast, sales of nondurable goods fell 0.5 percent in February. Looking specifically at durable goods activity in February, new orders strengthened for electrical equipment, appliances and components (up 3.4 percent), furniture and related products (up 2.9 percent), primary metals (up 2.8 percent), motor vehicles and parts (up 1.5 percent) and machinery (up 1.2 percent). Sales were flat for fabricated metal products and slightly lowered for computers and electronic products (down 0.1 percent). The Bureau of Economic Analysis and the Census Bureau reported that the U.S. trade deficit rose from $56.67 billion in January to $57.59 billion in February, the highest level since October 2008. While that headline will likely make news, it is important to note that trade volumes have risen significantly over the past year as the overall health of the global economy has strengthened. Goods exports have increased from $127.63 billion in February 2017 to $137.18 billion in the latest figures, up 7.5 percent over the past 12 months. Goods imports jumped 11.0 percent year-over-year, up from $192.94 billion to $214.19 billion. Nonetheless, the gain in goods imports in February outstripped the increase in goods exports, pushing the trade deficit higher. More importantly for manufacturers, exports have started 2018 on a positive note, extending the nice rebound in 2017. U.S.-manufactured goods exports totaled $175.22 billion in January and February of this year, up 4.99 percent from the year-to-date total of $166.89 billion in 2017. In addition, U.S.-manufactured goods to our top-two trading partners also improved through the first two months of 2018 relative to last year: Canada (up from $42.01 billion to $46.10 billion) and Mexico (up from $37.68 billion to $42.03 billion). Digging deeper into the latest release, goods exports mostly rose—as noted above—led by increases in industrial supplies and materials (up $2.02 billion), automotive vehicles, parts and engines (up $925 million) and non-automotive capital goods (up $658 million). Consumer goods exports fell $840 million in February. At the same time, goods imports also increased, including sizable gains for non-automotive capital goods (up $1.82 billion), industrial supplies and materials (up $783 million), foods, feeds and beverages (up $767 million) and consumer goods (up $505 million). As the NAM explained in public comments submitted to the Trump administration in May 2017, there are many factors that impact and cause changes in the U.S. trade deficit over time, including overall domestic conditions and standards of living, domestic consumption and purchasing compared with saving rates and the price of goods in the market, which are, in turn, impacted by exchange rates, domestic structural issues (e.g., taxation, regulation) and openness to international trade. Furthermore, when the U.S. economy has grown, the trade deficit has typically expanded as U.S. economic activity and consumption grow, while the trade deficit has shrunk when the U.S. economy has showed slower growth. The Institute for Supply Management (ISM) reported that manufacturing activity continued to expand solidly in March, even as it pulled back from the best reading since May 2004 in February. The ISM Manufacturing Purchasing Managers’ Index declined from 60.8 in February to 59.3 in March, but the data continue to indicate strength in the sector overall. Indeed, the indices for new orders (down from 64.2 to 61.9) and production (down from 62.0 to 61.0) have exceeded 60—a threshold suggesting robust expansions for both measures—since at least June 2017. Exports (down from 62.8 to 58.7) and employment (down from 59.7 to 57.3) growth also remain quite healthy despite some deceleration in the March figures. Exports, for instance, had expanded at the fastest rate since April 2011 in February, with international sales helping to fuel stronger overall demand. The sample comments tended to echo those findings, with healthy gains in demand, production and hiring and a very optimistic outlook for the coming months. Several respondents cited supply and hiring constraints as the economy has strengthened and the labor market has tightened, with others noting accelerating costs. Indeed, prices for raw materials have remained highly elevated (up from 74.2 to 78.1), with the measure at a level not seen since April 2011. More than 57 percent of manufacturing respondents said their costs had risen in March, with just 0.8 percent suggesting they decreased. This reflects a rebound in some commodity costs, even as overall pricing pressures continue to be largely under control, at least for now. In other news, inventories (down from 56.7 to 55.5) expanded in March for the third straight month despite pulling back from February’s highest point since March 2010. More than anything, the recent uptick in inventories is consistent with the healthy growth in overall production.